Poyet was suspended last month along with first team coach Charlie Oatway and managerial assistant Mauricio Taricco. The Uruguayan has been manager of Brighton since 2009 and won promotion from League One in 2011. The problems began after Brighton’s 2-0 loss to arch rivals Crystal Palace in the Championship semi-final of the playoffs. Brighton officially apologised to The Eagles after excrement was found in the visitor’s dressing room, although no evidence suggests an Amex staff member was responsible. 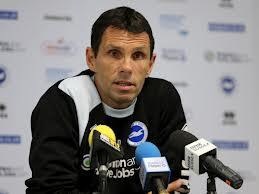 Poyet is under contract at Brighton until 2016 but has recently made no secret of his ambitions to manage at Premier League level, despite turning down an offer to manage Reading. There has also been a recent outcry in Spain, with fans of Real Zaragoza, where Poyet made his name as a player, calling for the club executives to make a move for the Albion boss. Zaragoza’s current boss, Manolo Jimenez, is expected to leave at the end of the season after the club were relegated from Spain’s top division, La Liga. Poyet’s future will be on mind of every Albion fan, who still seem to be backing the Uruguayan, who guided Brighton to a fourth place finish in the Championship this season, their highest since 1983. June 3, 2013 in Brighton & Hove Albion, Brighton and Hove Albion, Football, News, Sport.